On June 5, 2015 the Mississippi Ethics Commission cited the City of Bay St Louis for failure to comply with the Mississippi Public Record law set forth in authority section 25-61-1 et seq of the Mississippi Code (1972). 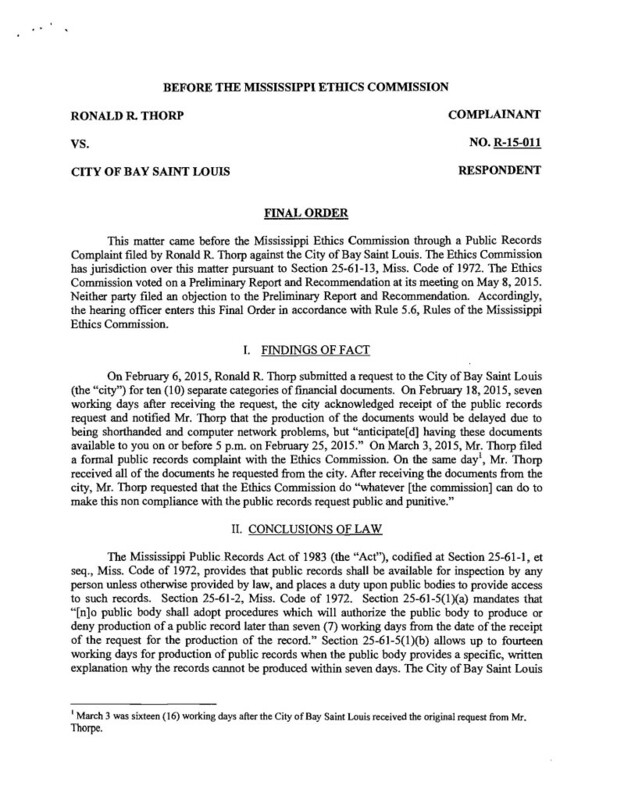 The City’s response to the Ethics complaint, lodged by Ron Thorpe of the Hancock County Alliance for Good Government claimed the City’s response to the Thorpe PRR was “proper complete and adequate”. However, the Mississippi Public Records statute is very clear that public records requests must be be produced seven days after receipt of the request for production or within fourteen days provided certain notification protocols are utilized. Bay St Louis City Clerk Katherine Smith failed to produce the records within the 14 day time frame, belatedly producing the requested records after Mr. Thorpe was compelled to file an ethics complaint on the matter. Several members of the public have complained to Slabbed New Media regarding the City of Bay St Louis openly flouting compliance with the Mississippi Public records law as well as in public comments to the City Council. These compliance problems coincide with the exposure of the financial crisis that gripped the City in 2014, when it was forced to refinance its Water and Sewer Bonds or face default. Bay St Louis Mayor Les Fillingame had previously steadfastly maintained the City was solvent despite the imminent default, which was averted with the refinancing of the bonds at a cost to the taxpayers of over $150,000. Finally, sources familiar with the operations of the State Auditor’s office indicate to Slabbed New Media that an investigation has been opened into certain of the City’s financial practices, including the issuance of $500,000 of debt without any apparent statutory authority that was used to pay past due bills owed to the Hancock County Utility Authority dating to the 2013 fiscal year. Those wishing to see the final order should click below to obtain the two page pdf. I’ve been kicking this whole Bay-Waveland School District becoming the City of Bay St Louis’ capital projects fund around for a few days and I’m coming to a few inescapable conclusions that include the term malfeasance. Since Slabbed began covering local Hancock County government the only constant is the rate at which schemes are hatched by Bay St Louis Mayor Les Fillingame, all of which costs money, a commodity everyone agrees is in short supply at the City of Bay St Louis. This does not stop the City Council from regularly being derelict in its statutorily charged duty to oversee the municipal purse, which in turn lends an Alice in Wonderland type quality to the entire sad affair. If the city fails to raise rates, he said, that could make the bank trustees in charge of the bond nervous and they could legally require the city to pay the funds back immediately. Falgout countered that the auditor is concerned about far more than the city’s utility budget. So we getting this folks, we have the City Clerk blaming the Going Concern opinion on just the Utility Fund while the Auditor’s are telling the City Council they are concerned with the entirety of the City’s dismal financial situation. Kolf used that misconception in an attempt to strong arm the City Council into adopting the Mayor’s Utility rate hike, a proposal that according to Councilman Joey Boudin the council saw for the first time just before the start of the recessed meeting. City attorney Donald Rafferty told the council he felt the proper thing to do would be to announce to the bank trustees that the city likely not be able to make the first payment on the refinanced bond.